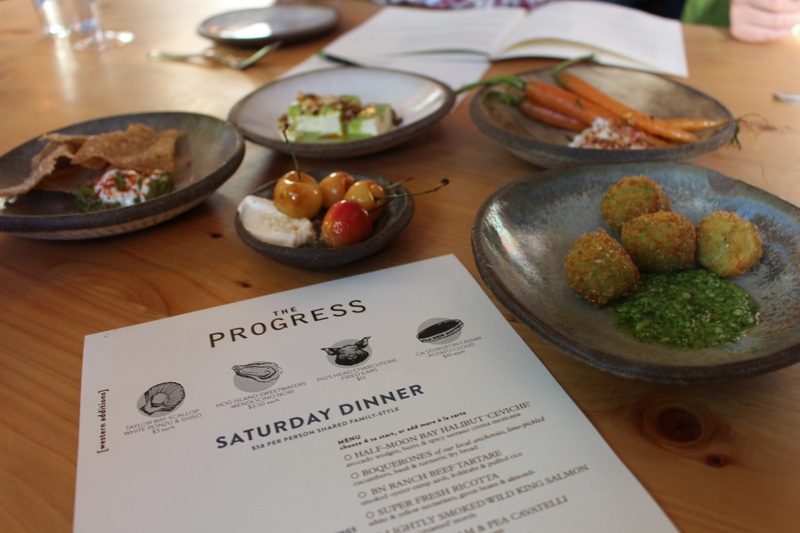 The Progress, sister restaurant to the critically acclaimed State Bird Provisions (“State Bird”), is one of the hottest restaurants in San Francisco. It is State Bird’s more evolved, poised and bigger sister. 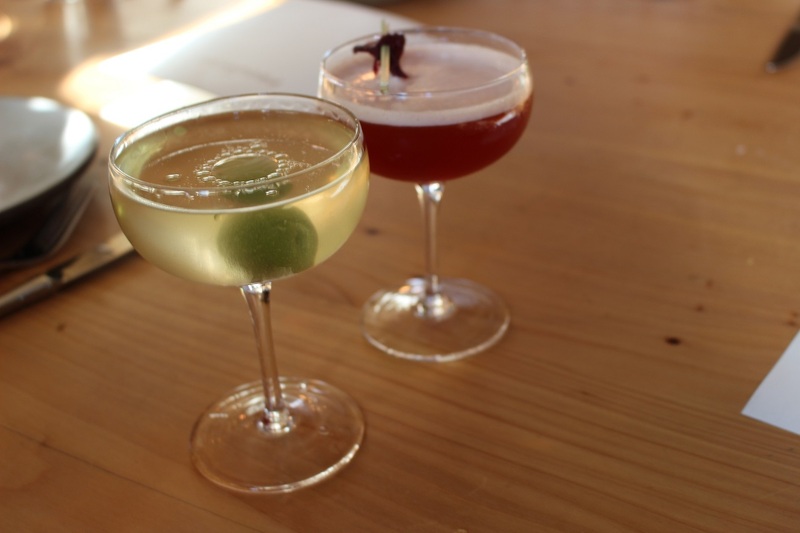 The Progress serves inventive yet refined family style cuisine in place of the whimsical small plates dished out on dim sum carts at State Bird. Situated adjacent to State Bird, The Progress is built within the shell of the historic Progress Theatre that shuttered in the 1920s. Fast forward to 2016, the interior of the restaurant is modern, accented with airy high ceilings and sweeping earthy tones. “Family style” at The Progress starts off with five chef-chosen small bites for the table before the table selects four entrees from a list of a dozen different main courses served family style (USD$58 per person). Small plates termed “Western Additions” can be added for variety to main courses at USD$3 - $12 per plate. Tack on an additional USD$10 if you have room for dessert. 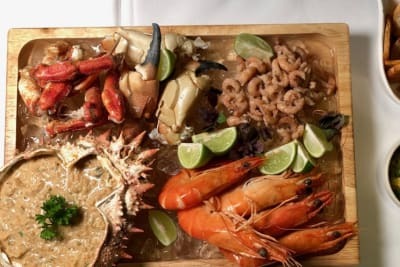 The four entrees are portioned generously and enough to fill the belly; additions and dessert are recommended for the adventurous or the insatiable eaters. We started off with some cocktails (~USD$12 each): The Black Metal (lemon infused tequila, sherry, punsch, strawberry, lemon, grapefruit bitters), Sunny Jim (gin, lemon, vanilla, pineapple, kaffir lime leaf, soda) and a classic Martini with floating olive oil droplets that offered an unexpected yet balanced richness. The drinks were creative and delicious. First, the table was adorned with a round of chef selected bites. 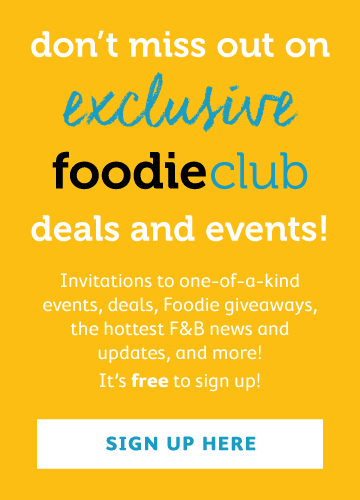 We noshed on smashed curried peas on seven pepper cracker, fava arancini with pine nut pesto, tofu in green coconut curry with spiced peanuts, roasted rainier cherries with almond cream and roasted carrots with whipped goat cheese. The crowd pleasers were the fava arancinis, which were hot and creamy with a hint of bright nutty flavour from the fava beans. 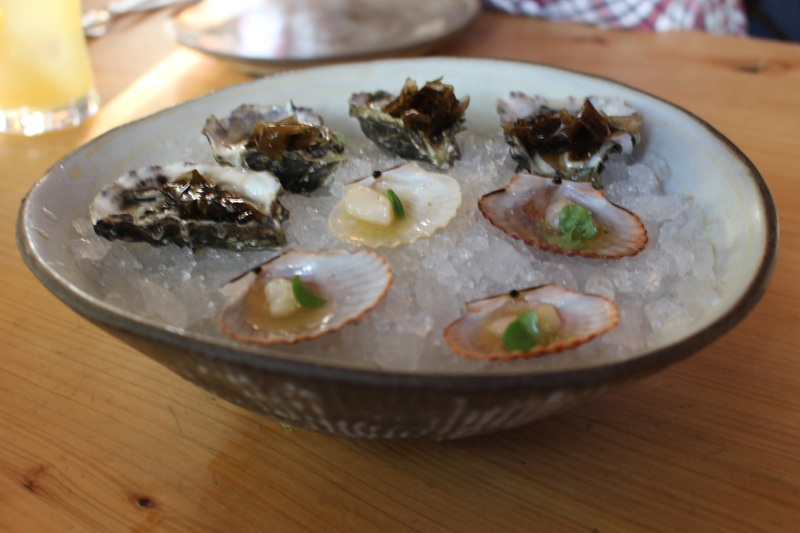 We decided on two Western additions: Taylor Bay scallops with white ponzu and shiso, and Hog Island Sweetwater oysters with Mendocino nori. Both were incredibly fresh, the scallops were tender and sweet while the ponzu’s tang and the minty earthiness of the shiso took the scallop to new heights. Then out came the four courses we hand picked. Half Moon Bay halibut ceviche with avocado wedges, beets and spicy serrano crema. 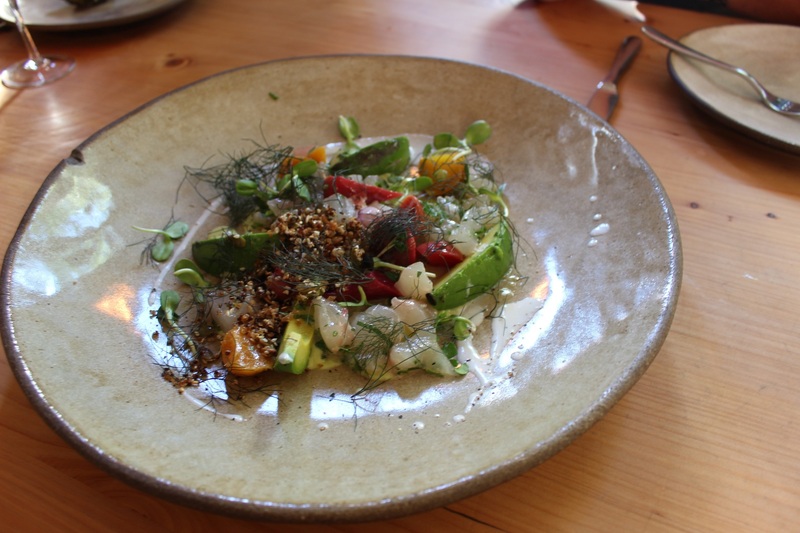 Fresh and accentuated with a texture kick from the crunchy spice trail scattered atop the ceviche. The highlight of the night was the Double Duck Broth Dumplings with morels and pickled turnips. The broth had been simmered for two days, flavour packed from roasted duck bones, neck and wings. 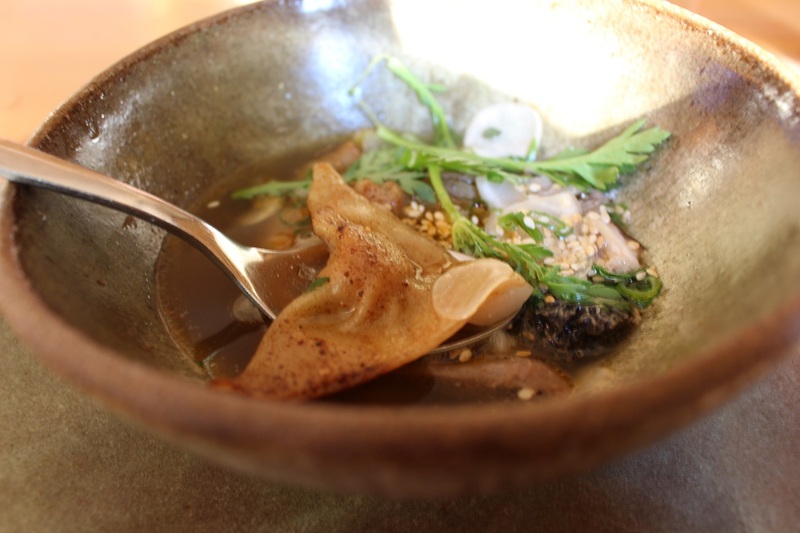 This flavourful soup was finished with smoked duck meat dumplings, earthy morels and pickled turnips. An umami flavour explosion. Next came the Lamb Shank-flat Noodle ‘stir fry’ that was seasoned with ground seven pepper, wild ramps and savoy cabbage. The noodles were homemade and a cross between Chinese hand-pulled noodles and pappardelle pasta. The lamb was tender but could have used some extra spice. 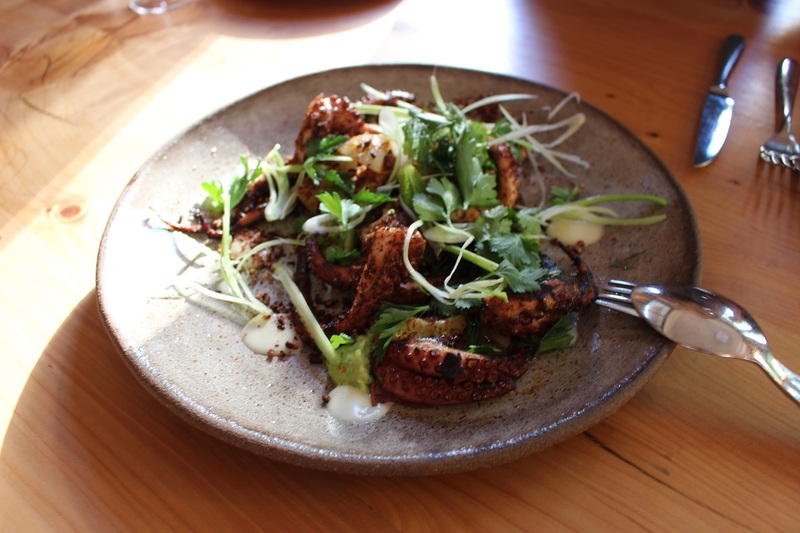 To round things out, we ordered the grilled Spanish octopus with shell bean hummus, shaved fennel, toasted black rice and preserved lemon. The dish was well cooked and the toasted rice added great texture to the tender octopus. The Progress elevates the family style dining experience while still conserving the intimate experience of those Sunday night dinner gatherings. 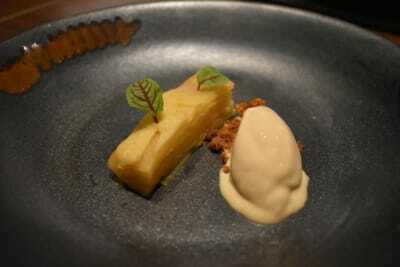 I’d recommend checking out The Progress for its new age family style concept and fresh, creative, Californian fare. The hardest part will be deciding which four dishes to share. Good luck and may your chosen dish make the cut.